T. Muraoka. 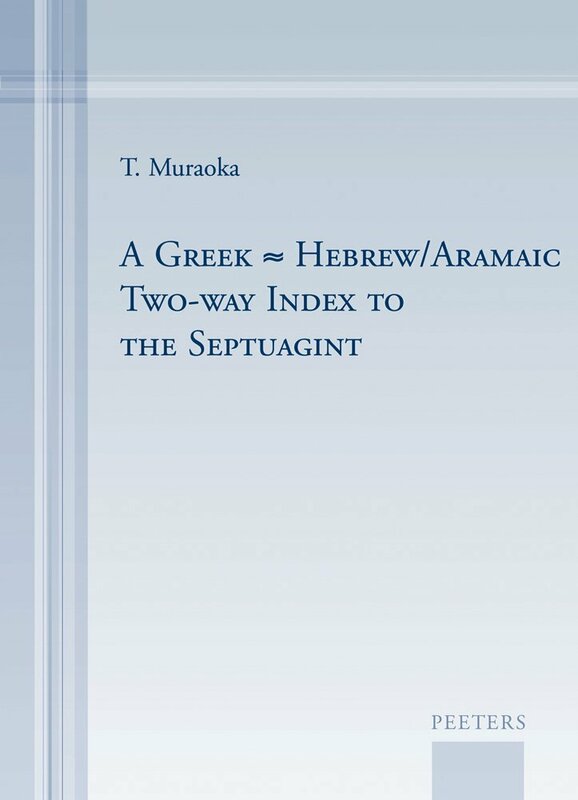 A Greek-Hebrew/Aramaic two-way index to the Septuagint. Louvain ; Walpole, MA: Peeters, 2010. ISBN: 978-90-429-2356-0. £60, $81. Pp. 384. The index is divided in two-sections. Part one includes the Greek-Hebrew/Aramaic information that was excluded in the latest edition of Muraoka’s lexicon, as noted above. Part two gives the mirror image of the information of the first part, that is, the Greek terms that were used by translators of the LXX for each Hebrew or Aramaic word. The most notable update of HR in this index is the inclusion of data from 1 Esdras and new DSS information. From Muraoka’s earlier index to HR (1998), he retained the corresponding page numbers and columns in HR for each of his entries. Finally, in the introduction of both the first and second part, Muraoka includes a full listing of symbols that are important to be informed of if one wants to effectively use this tool. Probably the most important symbol for this edition of the index is *. This specific symbol indicates a new word in relation to the lists in HR. There are always limitations with works, and with this one, two are salient to me. First, one will notice that Muraoka’s index is very slim, especially compared to HR. One reason for this is that he excludes the listing of bible references for each corresponding Greek and Hebrew word. Though Muraoka’s work is an index that has a slightly different goal in mind than a more comprehensive concordance, HR will still be useful to the scholar or pastor who seeks to investigate each supposed sematic parallel proposed by Muraoka. Second, Muraoka’s index is based on the critical Göttingen edition of the LXX. This aspect does set it apart from what HR had available to themselves when assembling their tome. And it will also, to many, be an added benefit to this work. However, further note is required. The value of Göttingen’s critical edition is beyond words for the investigation of the LXX text, and should in no way be understood as an undervalued resource by this reviewer. But, a new wave of scholars is valuing the LXX textual tradition is a new way. For example, Brill’s Septuagint Commentary Series now includes a few commentaries that work off of only one manuscript, namely, Vaticanus. The Septuagint is not simply being used for its use in text criticism of the MT, but it is being appreciated for own sake, and now even individual MSS are being studied for their own theological and textual witnesses. So as scholarship continues to ebb and flow in its preference for an accurate composite text or a complete, extant MSS, the impact of this preference upon such reference works like Muraoka’s index is something to keep an eye on; but still its impact is not decided. And, finally, I do not place this comment under a limitation of the work, but more as ‘an area of growth’ for the field. 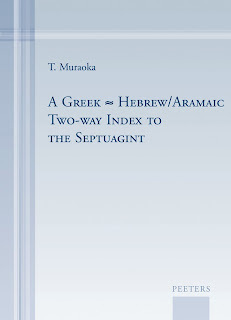 In Muraoka’s work he notes that though much data in HR has been critically examined, it is still incomplete: “ideally, one should study each verse of every Septuagint book translated from either the Hebrew or Aramaic and compare it with what is judged to be the Semantic Vorlage of the Septuagint text.” (vii) The critical investigation and work is evident, and of course more needs accomplished for greater accuracy. But how much can one expect of one man?! LXX research is certainly meeting another high-water mark in its history. The “ideal” work pointed out by Muraoka will surely be accomplished soon, I suspect, and those women and men who complete this work will be standing almost completely on Muraoka’s shoulders for what their research builds upon. Overall, how could this work be given anything but high praises? My general rule of reading anything the Muraoka has published is yet again confirmed with his latest contribution. This volume will sit upon a special shelf that I reserve only for my most often reached-for reference works. I continue to pray for a long life for Professor Muraoka so that his work will continue and we will continue to benefit, as the Lord wills! My appreciation to Peeters for the opportunity to review this book with the expectation of an objective review. Bantam Review, Vol. 2, received!